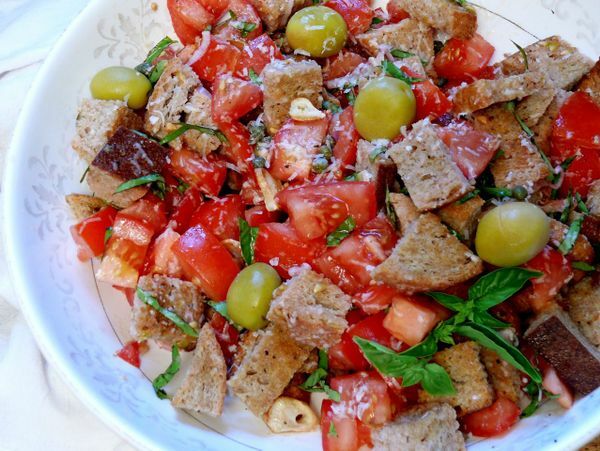 there are probably about as many panzanella recipes as there are households in tuscany, because it's essentially an old bread salad (stale and hard bread works best here) with tomatoes and whatever other vegetables need using up. it's a "leftovers" dish so i feel especially free to customize it, and i have. for instance, i like this salad to be especially tart so i add olives in addition to the capers. i also like to make the croutons for this dish very dry, so i make mine in the oven instead of over the stove. and often when i have the oven going, i use it as an excuse to roast some garlic, so i throw some of that into this salad too. one tip i think that's worth trying is to let the sliced shallots mellow out in the vinaigrette while you get on with the rest of the prep. it's a tip i learned from my mom. 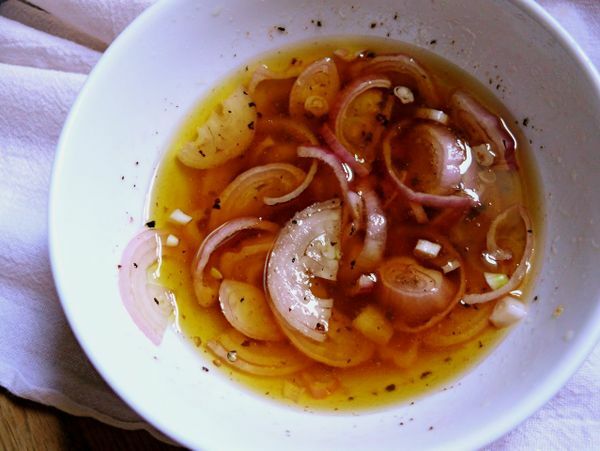 having them sit in vinegar takes the edge off the shallots and it also imparts more flavour to the dressing. so i'd say try that, but use the rest of the recipe that follows as a jumping off point to make your own favourite panzanella. prepare the croutons: pour 2 tbs of oil into a small bowl. brush both sides of each piece of bread with oil. toss the garlic slices in the remaining oil in the bowl to coat the pieces evenly. cut the bread into 1-inch cubes, and spread the cubes and the garlic flat on a large baking tray. sprinkle with 1/4 tsp of salt. bake, uncovered, in pre-heated oven for 20 minutes, tossing halfway. check close to the 20 minute mark to make sure the garlic doesn't burn. meanwhile, whisk 3 tbs of oil, vinegar, oregano, oregano, salt and pepper together in a bowl. add the sliced shallots to the bowl, toss well and set aside. in a large bowl combine the tomatoes (including the tomato water), olives, capers and basil. 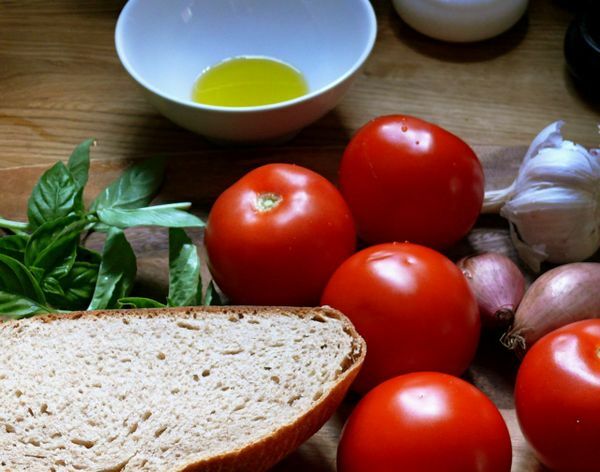 remove bread and garlic from oven after baking and allow them to cool slightly. then add them to the tomato mixture and toss. add the dressing and shallots to the mixture, and the cheese, but reserve about 1 tbs each of the dressing and cheese. toss well. allow to sit at room temperature for about 20 minutes so the bread can soak up some of the dressing and the flavours can meld a little. then toss again, drizzle the reserved dressing over top, and sprinkle with remaining parmesan cheese. dust with maldon salt and serve. Wait until you’ve had this in Tuscany! Looks yummy! And who doesn’t love a good dish that helps you use up your food scraps and leftovers? A major plus!